Our final concert will feature two young local soloists: accordion player Michael Bridge and clarinetist Kornel Wolak as "Double Double Duo" performing a unique program that fuses classical showpieces with jazz, world and pop music. Various arrangements of popular pieces for clarinet & accordion duo with orchestra will be part of the program directed by Jean-Michel Malouf. Highly praised on two continents for his glorious tone, precise technical control and musical imagination, Kornel Wolak is well on his way to a major career as a soloist and chamber musician in both classical and cross-over repertoire. Critics have hailed him for his playing that showed "admirable calm and patience in shaping beautiful sonorities…full of energy," (Andrzej Chylewski, Glos Wielkopolski); "beautiful [playing] in the lyric selections…a lot of imaginative colors, dynamics, and rubato," (Jolanta Brozda, Gazeta Wyborcza), and "control and a smooth, elegant expressivity are what make Wolak shine," (John Terauds, Toronto Star). As a member of the renowned Quartetto Gelato from 2007 to 2009, Wolak performed on its 2009 recording, Musica Latina. He also appears as soloist on a 2007 CD of Karol Kurpinski's Clarinet Concerto, released by Channel II of Polish Radio – a CD that was nominated for Poland's highest recording award, the "Fryderyk". Wolak is a regular fixture on the airwaves, including CBC Radio 2, Classical 96.3 FM, Public Radio International, and in the US, on National Public Radio. Kornel Wolak's artistry has been admired by audiences at over 90 concerts in North America alone. As a soloist, he has performed with the Quebec Symphony Orchestra, Toronto Sinfonietta, Poland's Poznan Philharmonic Orchestra's opening 60th season gala concert, the Polish Radio Chamber Orchestra, and Charleston (North Carolina) Symphony Orchestra, amongst others. He has a return engagement with the Poznan Philharmonic later in 2010. As a chamber musician, he has appeared with the Wieniawski String Quartet, the Glenn Gould String Quartet, and the Lodos Wind Quintet. His orchestral experience includes regular freelancing with the Toronto Symphony Orchestra, as well as other Ontario orchestras. Intent on increasing the clarinet repertoire, Wolak has performed the Toronto premiere of John Adams' "Gnarly Buttons" Clarinet Concerto, broadcast on CBC Radio 2, and Marc Neikrug'sThrough Roses at the Glenn Gould Studio. Also devoted to music education, Wolak established Music Mind Canada (MMC), an initiative that designs, promotes, and produces educational programs for schools, local communities, and other groups interested in learning about music. Well-structured "theme recitals" are one of many ways that he introduces music to wide audiences. The W?oc?awek Tribute noted that "Mr. Wolak's natural way of connecting with the audience made his educational series of recitals entitled From B(ach) to Z(emlinsky) an unexpected learning through the art experience for everyone….with his excellent balance of playing, lecturing, and demonstrating made the music accessible…. The audience was moved by the music, properly informed by the artist, and thoroughly entertained." 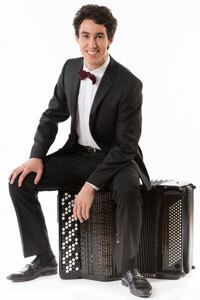 Between 2007 and 2009 alone, Wolak has performed more than two dozen school shows across Canada and the US, promoting classical and cross-over music to young audiences. Mr. Wolak won the Royal Conservatory's Concerto Competition in 2006, the Glenn Gould School's 2005 Concerto Competition and the Presser Music Award from the Presser Foundation Earlier, as a student, he won first prize in the Poznan Clarinet Wind Instruments Competition, the Polish All-Wind Instruments Competition, and the Indiana University Clarinet Department Competition. He has honed his craft through studies with clarinet masters at summer music festivals in Prague, Paris and elsewhere. Dedicated to being a fully rounded wind player, Wolak has also studied period instrument performance. Born in Bialystok, Poland in 1979 into a musical family (his father was a trumpeter and his mother a violist), Wolak began piano lessons at six, and took up the clarinet six years later. After early studies at the Music Academy of Poznan and subsequently, at the Musical Lyceum, in 2001, he was a scholarship student at Indiana University's Jacobs School of Music, where he earned his performance certificate and, two years later, his Master of Music degree while studying with Eli Eban. He put his doctorate on hold in order to pursue advanced orchestral studies under Joaquin Valdepeñas at the Glenn Gould School of Music in Toronto in the fall of 2005, where he earned an Artist's Diploma.